There are so many tools available on Cydia for Jailbroken iOS devices. Some are very beneficial and that`s why you must have on your iOS device. So today we will talk about a some must have hacks for jailbroken iDevices. List of Cydia hacks that you should install on your Jailbroken iOS devices. We have already talked about few useful Cydia tweaks. 3G Unrestrictor a very useful iPhone hack. It allows you to make the 3G and EDGE networks to work like Wi-Fi. This hack allow VoIP apps like Fring and Skype to work over 3G or EDGE networks. 3G Restrictor is available for $3 from Cydia. There is also a three-day trial period availablefor this tweak. But, if you are on limited 3G connection, this app might not be for you. Dashboard X is one of the best and easy to use widget for the jailbroken iPhones. You just need to enter the icon editing mode by tapping and holding an icon. Then taps and holds on any empty space on homescreen. Doing this shows installed widgets on your device to appear in a list. A new screen allows you to choose ‘Auto Center’ and ‘interaction’ options. 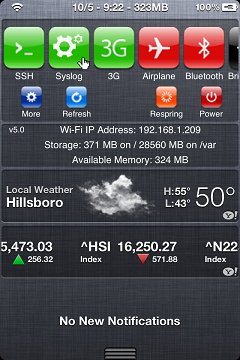 Dashboard X costs $1.99 and can be found through ModMyi repo. SBSettings is a very useful hack for a jailbroken iPhones. This Cydia hack allow users to get quick access to many settings of the phone without exiting any running application. It also shows toggles or buttons in order to disable, enable and adjust settings. It is a free app avilable on Cydia via BigBoss repo. Backgrounder is also very useful hack. It is one of the most used hack available on Cydia. This allows the user to decide that how apps will function when they are closed. This allows enable or disable multitasking independently for every app. It is an awesome app for multitaskings and adds an icon on the homescreen. It is available for free at Cydia’s BigBoss repo. QuickDo transforms iPhone into a fully functional touch screen device. This allow you to control everything by gestures or touch. This is perfect for the multi touch featuring iPhones. Users can perform many actions through different gestures or movements made by the finger on the trigger bar. There are 6 gestures that you can assign to the 13 available actions. It also place 5 icons on the lockscreen. This app is available for $7.66 from Cydia’s BigBoss repo. These are some of the must have Cydia hacks for Jailbroken iOS users. Feel free to comment!